The book is currently only available as a Kindle e-book via Amazon. Published by Leonie Press, December 2014. Price: Please check on your local Amazon site, using the link below. 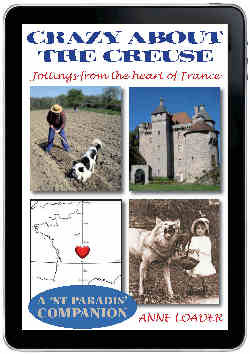 If you enjoyed Anne Loader’s St Paradis Trilogy about her family’s experiences in a haunted granite farmhouse in the depths of the Limousin countryside, you’ll want to read the newly published companion volume, the e-book "Crazy about the Creuse – Jottings from the heart of France". However, now the Loaders have retired and can spend much more time at St Paradis, Anne felt that the previous journal format was inappropriate. So to please her fans, she has gathered together a collection of 73 illustrated articles – both humorous and serious – from those that she contributed over a period of several years to pontnoir.com, a website aimed at English-speaking home-owners in the department of the Creuse. The cyber-column was also called “Crazy about the Creuse” and was written under the pseudonym of “Annik”. The articles have been updated and added to for the Kindle version and many additional colour photographs have been included – bringing the number of illustrations up to 160. There is an introduction about the department for those who do not know the Limousin region, and the e-book should appeal to all those who love France and the country's quirky ways. The work is a 110,000+ word, 160 illustration pot-pourri of individual pieces and in-depth studies, each around 1,500 words long, rather than a narrative to be read from cover to cover in one sitting. Several themes emerge though, including light-hearted accounts of personal experiences in a tiny commune, features on social history and folklore, observations on French life, and practical advice for those new to living in France. The actual price you will be charged by a distributor for one of our e-books varies considerably depending on a range of things which makes it impossible to include prices here. If you would like to buy one, please check on the distributor's site that you normally use. One of the major factors is that unlike paper books which are zero-rated in the UK for VAT, e-books attract the VAT at the national standard rate. Due to changes in European VAT rules on 1st January 2015 the VAT to be charged will depend on the country in which the e-book is bought rather than the previous situation which was the country from which it was sold. The applicable level of VAT will vary between 5.5% (France) and 23% (Ireland). Anne Loader started in journalism in 1965, with East Midland Allied Press in Lincolnshire and Norfolk. After her marriage she worked as a reporter and education correspondent on the Southern Evening Echo at Southampton. She was the feature writer on Northwich World from 1980-84 and was editor of the Crewe Guardian for ten years until 1995 when she was made redundant. She now jointly runs Léonie Press, publishing short-run books on autobiography and local history. Anne wrote the first of the series of books, 'A Bull by the Back Door', to amuse her late mother, then an Alzheimer's sufferer, who had lived in France and had instilled a passion for the country in her daughter from her earliest years. 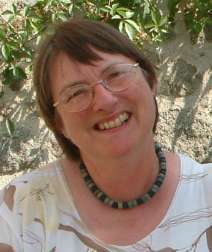 Anne has also written for British glossy magazines specialising in French subjects.